Ecologs are not only environmentally friendly, but also a clean and convenient alternative to traditional wood and charcoal. In addition, they are highly versatile and may be used in fireplaces for heating, for indoor and outdoor BBQs and also in Weber-type kettles. 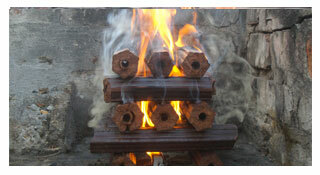 Ecologs produce high heat and long-lasting coals. They’re available boxed in 5kg packs together with an eco-friendy firelighter for added convenience! Want to know more about our ecologs? Here are some interesting facts about eco logs and how using them will help preserve our environment. Eco logs are a 100% recycled product and 100% natural. 1. What are Eco Fire and BBQ logs? They are eco-friendy logs produced from the compressed grape seeds, a by-product of the cold-pressed method of extracting grapeseed oil for cooking and beauty applications. 2. Is it charcoal or wood? No it is not charcoal or wood, but rather an eco-friendly alternative. 3. How do I light these logs? You can use any firelighter, however we have found that the Greenlight Firelighter (a paraffin free eco-firelighter works very well. 4. What can I use these logs for? They’re ideal for both BBQ and heating. They also work well in pizza ovens, closed combustion heating systems and Weber-type kettles. 5. How long will the coals last for a BBQ? Approximately an hour or longer. If you have very juicy meats or are using marinades that may drip onto the coals, they will shorten the life of the coals as would happen with traditional fire wood or charcoal. 6. Do they contain any chemicals or binding agents? No – they are produced purely by compression of the remaining grape seeds after cold-pressing them to extract the grape seed oil. 7. How many logs should I use for a BBQ? Our Ecologs are packaged in 5kg boxes, which are more or less the equivalent of a single bag of traditional wood for BBQ purposes. Just as with wood or charcoal, you would need to determine how much to use depending on what you are braaing, how many guests you have and wind conditions. 8. How do I use these logs? 9. How should I store these logs? Ecologs must be stored in a dry place. As they are perfectly shaped, they may be easily packed and do not take a lot of space. 10. Do you have any certifications? Yes, we are ISO 14021:2016 – Environmental Labels & Declarations – certified. BBQ green and clean – use Green Lite Eco Firelighters! Click here to order from Eco Fire & BBQ today!